Fire boat response crews battled the blazing remnants of the offshore oil rig Deepwater Horizon, off Louisiana, in April 2010. Halliburton Energy Services has agreed to plead guilty and pay the maximum fine for destroying evidence in the Deepwater Horizon disaster, the company and the Justice Department said Thursday. Besides agreeing to pay a $200,000 fine, Halliburton accepted three years' probation for its guilty plea to one misdemeanor count related to deletion of records. 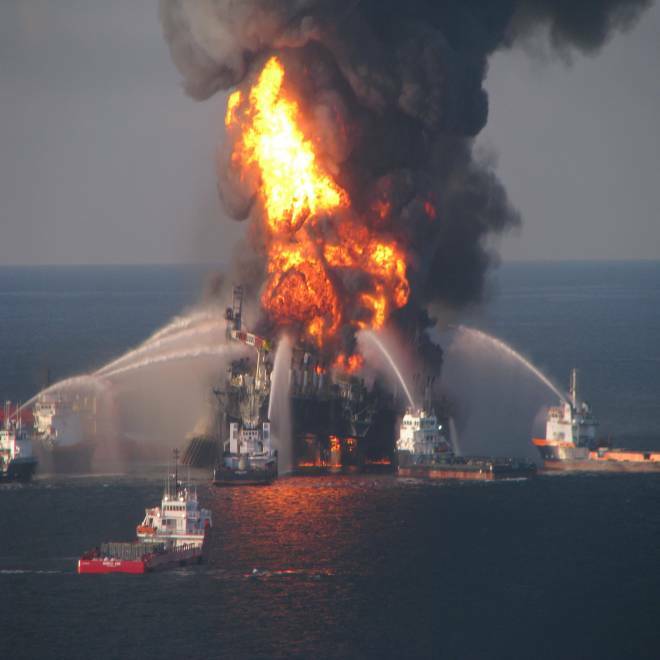 In return, the Justice Department stipulated that it won't pursue further charges in the April 2010 explosion at the Deepwater Horizon rig in the Gulf of Mexico, which killed 11 rig workers and caused the largest oil spill in U.S. history. Halliburton, which helped run the rig, separately contributed $55 million to the National Fish and Wildlife Foundation, a gift that both sides said was voluntary. The settlement, which is subject to court approval, was filed Thursday in U.S. District Court in New Orleans. It said employees were directed to destroy the results of Halliburton computer reconstructions of the blowout in May and June 2010. The Justice Department said that in agreeing to plead guilty, Halliburton "has accepted criminal responsibility" for destroying the evidence. In a statement, Halliburton chose to highlight what it called "the company's significant and valuable cooperation" in the investigation. In November, oil giant BP, which leased the rig from Transocean Ltd. of Switzerland, pleaded guilty to manslaughter and obstruction of Congress in a settlement and agreed to pay $4.5 billion in fines and penalties — including the largest criminal fine ever, $1.256 billion. It still faces possible damages of up to $17.6 billion in separate proceedings under the Clean Water Act. Transocean reached a settlement with the Justice Department in January in which it agreed to pay $1.4 billion in fines and penalties.